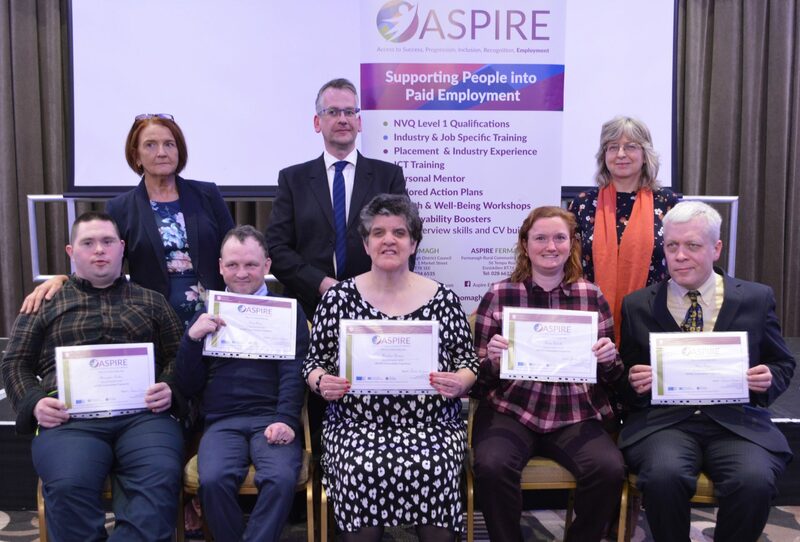 The exceptional commitment and success of the ASPIRE programme participants was celebrated at Fermanagh and Omagh District Council’s annual participant recognition event held recently at the Silverbirch Hotel, Omagh. The ASPIRE programme, led by Fermanagh and Omagh District Council in partnership with the Western Health and Social Care Trust, the Education Authority for the Western Region and its delivery partner, Fermanagh Rural Community Initiative (FRCI). The ASPIRE programme which is part funded through the Northern Ireland European Social Fund 2014-2020 and the Department for the Economy, supports individuals aged 16 years and over into paid employment and is targeted at those currently unemployed or economically inactive seeking employment. 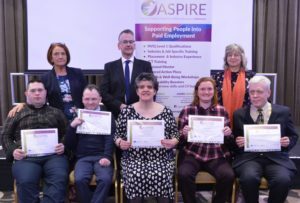 ASPIRE participants from across Fermanagh and Omagh, were recognised and applauded for their individual journey and achievements gained as a result of participation in the ASPIRE programme. Welcoming everyone to the recognition event, Chairman of Fermanagh and Omagh District Council, Councillor Stephen McCann remarked, “One of the great strengths of ASPIRE is that it provides a personalised approach, tailoring the programme to suit the needs of the individual. This approach recognises that each one of us has specific barriers and challenges in life and overcoming these will differ from one person to another. Whilst employment is the end goal, the support offered also takes account of personal development. Councillor McCann also acknowledged the European Social Fund and the Department for the Economy for financial assistance provided to support the delivery of the ASPIRE programme. In In year 3 of the programme, 46% of programme participants progressed into paid employment with a further 14% attaining positive outcomes ranging from further and higher education to additional training and volunteering. To find out more about the ASPIRE Programme CLICK HERE.